Eltronicschool. - This is one robot project for you who want to explore your knowledge and ability to build robotic in this time. In this project we will show you gesture controlled robot using Raspberry Pi that written by John. Beside we will show component part that needed in this project, we also will give you global description about this project and we will allow you to read more this project from original source using the link given. 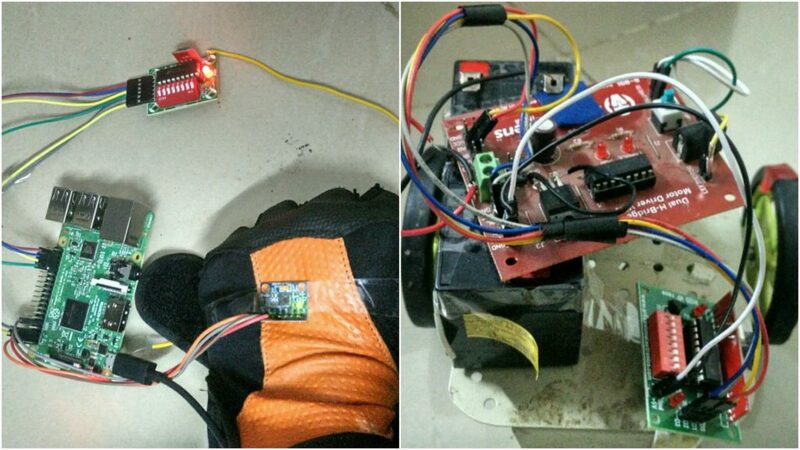 This is robot project with build gesture controlled robot using Raspberry Pi. Have you ever tired of controlling everything with buttons? Thought of controlling something with simple hand movements by sitting on your lazy couch? If yes, then you are at the right site. In this tutorial we are going to control a robot driven by two DC motors by simply using hand movements. There are different kind of sensors to detect your hand movement like flux sensors, Accelerometers and other gravity based sensors. So for wireless transmission we are going to use RF 434 module which transmit 4 bit data. 4 bit data means you can transmit 16 different combinations i.e., 0000 to 1111. Further in this tutorial we will use an encoder and decoder to avoid interference in the air interface. A motor driver will drive the motors from using the decoder data. And now you can read more the robot project with gesture controlled robot using Raspberry Pi from original source using link HERE.